A beautiful autumn day with clear blue skies and the temperature just above 20°C awaited us for the last game of the season at the picturesque Hirschanger. Captain for the day Rabbani lost the toss and MCC were asked to field. Club captain Weston stayed only long enough to take some video films then had to leave to change into his toy boy kit for an excursion to the Oktoberfest. Naveed and Matheen opened the batting for Pak Orient and faced Scott and Blades. The run rate was kept under control, the score being 32 for 0 after seven overs but, significantly, 11 of the runs were wides. The two openers fell in the ninth and 13th overs respectively but numbers three and four both scored rapidly and turned in the highest scores of the match. One of them, a new player on the scene, went under the glorious name of Sher Khan and was the cause of many Kipling quotes. Khan finished on 54 from 61 balls before being caught by Fudge off Rabbani`s bowling and his partner, Sheraz, scored 64 from 51 balls before retiring. Fudge had taken an excellent catch in the deep having earlier treated us to a beautiful ballet dancing sketch – at least that is how Sestan defined it – also on the boundary while missing another catch completely. Basit, playing again for Pak Orient, made 31 not out but none of the other batters made any significant scores. After 35 overs Pak Orient were 243 for 8 including 51 extras leaving MCC needing only seven an over to win. Fudge had provided the teas and as it was the last game of the season we decided we would offer teas to the opposition too. They promptly ate everything and Fudge had to leave for the supermarket again to purchase some snacks for the MCC players. Palfrey and Veser opened MCC`s innings, Palfrey giving only a single chance in his innings on the third ball he faced leaving MCC on 0 for 1 after three balls. Sarma replaced him and he and Veser put on 69 runs for the second wicket, Veser going for 35 from 32 balls in the 12th over. That, unfortunately for MCC, was it with only Sear of the remaining batsmen reaching double figures. A couple joined in the duck race and MCC were all all out for 102 after 25.4 overs. The main destoyers were two slow spin bowlers, the infamous Sher Khan (1 – 18 from 7) and Hashim (5 – 14 from 7). Scott 0*, 6 overs, 0 mdns, 34 runs, 0 wkts. MCC, 102 for 10, lost to Pak Orient by 141 runs. After the strenuous tours to Trento and Prague it was back to the Hirschanger for the BCV T20 semi-final against Serendib who had thrashed us by six wickets in the league. The school summer-holidays were over so we had been able to get some good preparation with a Friday afternoon training session. Captain Weston won the toss and chose to bowl on a slightly damp playing area after some heavy rain during the night. The usual Serendib opening pair of Berenger and Milan Fernando came out to face Blades and Sear as the opening bowlers for MCC. Things started to look good, Berenger falling to Blades off the second ball of the match and Sear following up with a maiden in his first over. After five overs Serendib were 21 for 1 and MCC were happy. Unfortunately thereafter the Serendib batsmen, Fernando and Basit, both began to score regularly and of the remaining 15 overs, eight went for double figures. These two batsmen scored 148 runs between them, Fernando finally falling, caught and bowled to Sear, in the 19th over having hit 120 from 59 balls, including 5 fours and 11 sixes. The captain had tried nine bowlers during the innings, Lovell being the only one not to be asked to bowl apart from the captain/wicket keeper himself. Serendib finished on 177 for 7 from their 20 overs, leaving MCC a little shell shocked but still able to enjoy the splendid tea provided by the non-bowling Lovell. Weston and Lovell opened the MCC innings and got off to a good start. After five overs the score was 33 for 0 and well ahead of the equivalent opposition score. Weston fell in the 6th over for 19 to be followed by Lovell for 35 in the 10th over with the score on 73. The Serendib bowlers seemed to bowl a better length than had MCC and there were far fewer balls able to be lofted over the boundary for six. Throughout the innings MCC were only able to post three overs with double figures and despite a determined, spirited effort, the target set by Serendib was simply too high, the last MCC wicket falling in the 20th over with the score on 134. Blades 2*, 3 overs, 0 mdns, 17 runs, 2 wkts. MCC, 134 – 10, lost to Serendib, 177 – 7, by 43 runs. MCC MOM Lovell, highest score and excellent teas. 3rd September, first round, first match. A very hot and humid day in Trento, with temperatures in the middle thirties, saw captain Weston lose the toss against Trentino and being asked to field. The opposition appeared to be mainly of Pakistani heritage with their known preference for tonking the ball around with massive swinging hits. The rules of the tournament were that players had to retire on reaching 25 and the opening Trentino batsman, a gentleman with a rather solid figure, retired when he had reached 31 – he should actually have retired one ball and four runs earlier. That was his final contribution to the game for he neither fielded nor bowled but was replaced by another, more athletic player. The four MCC bowlers used went for around 10 runs per over, the exception being Wright who took one for 13 in his two overs. The cummulative Trentino scores at the end of each over were 0 -12, 0 – 22, 0 – 32, 1 – 34, 1 – 45, 1 – 54, 1 – 67 and 2 – 78. Weston and Clare opened the batting for MCC and the scoring was slow, the first boundary coming in the third over with the 15th ball of the innings. After the seventh over things were looking gloomy, MCC reaching only 60 for 2. However Wright did some marvellous tonking before being run out spectacularly after easily making his ground and Sarma and Turner then took us to 78 with an exciting two runs off the last ball of the innings. MCC`s cummulative scores after each over were 0 – 5, 0 – 10, 0 – 24, 0 – 32, 1 – 40, 2 – 50, 2 – 60, 3 – 78. MCC, 78 for 3, tied with Trentino, 78 for 2. Captain Weston lost the toss and MCC were put in to bat by Indomita, a team from Trento consisting mainly of Italians but not including Guido “Hitta ze Rabbish” Ronconi. Weston and Fudge opened the innings and scored at a rapid rate, Fudge falling in the third over with the score on 34. Embleton at number three was the only MCC batsman having to retire during the weekend after he scored 26. Some powerful hitting and aggressive running took MCC to a good score, the cummulative scores after each over being 0 – 11, 0 – 33, 1 – 41, 1 – 48, 1 – 63, 1 – 81, 2 – 89, 3 – 94. Clare 2*, 2 overs, 0 mdns, 6 runs, 0 wkts. MCC, 94 – 3, beat Indomita, 46 – 3 by 48 runs. Having competed well in the first round matches, MCC were not quite up to standard for this match – was it the long wait for the ice cream, the excess of vino, the impressive views in the Piazza or the excertions of the Pink Flamingo? I guess we will never know. Captain Weston made it three in a row for the toss and MCC were asked to field by Trento. Clare opened the bowling and after taking a wicket off his third ball things were looking up. Embleton, his opening bowling partner also had a good first over but thereafter it went pear-shaped. Trento finished with 105 from their eight overs, two of their batsmen retiring having reached 25. The cummulative scores were. 1 – 3, 1 – 16, 1 – 32, 1 – 47, 1 – 58, 2 – 79, 2 – 89, 2 – 105. 0 – 6, 0 – 16, 1 – 23, 1 – 34, 3 – 45, 5 – 52. MCC, 52 – 5, lost to Trento, 105 – 2 by 53 runs. 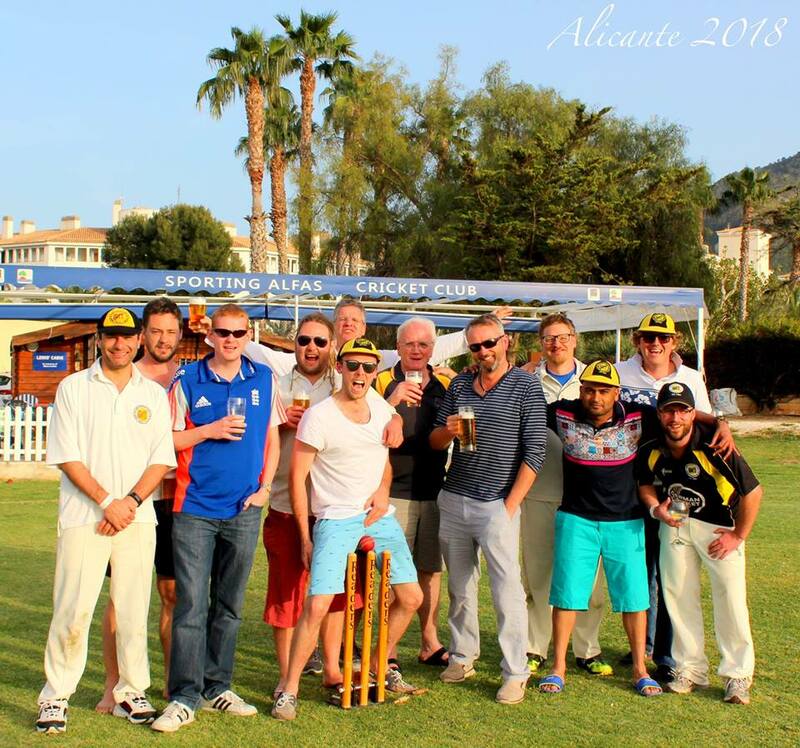 A combination of MCC and Tegernsee took on a combination of CCB and Punjab in a 30 over friendly at the Hirschanger. CCB won the toss and chose to bat and got off to a disastrous start losing their first two wickets, both for ducks, for a total of 6 in four overs. Blades`s first two overs were wicket maidens. The enthusiastic Yash from Tegernsee was his opening bowling partner. Captain Weston had obviously decided to give the Tegernsee players most of the bowling and have MCC players leading the batting, the bowling split being 18:12 in favour of the Tegernsee players. The bowling was pretty reasonable but the fourth and fifth wicket partnerships of 47 and 71 respectfully were hard to break. When the 5th wicket fell for 137 in the 24th over the captain had already resorted to bowling number three who outperformed a Caspari in his second over. After 30 overs CCB were 192 for 6, including 28 extras. Clare took his 20th catch of the season, an astonishing performance for an outfield player. Keeper Albert took a stumping and was so thrilled believing it to be his first ever for the club that he left without paying his match fee. In fact it was his third stumping so the excitement was unnecessary but don´t worry Wolfgang, we will only charge you one match fee. Weston and Wright opened the batting for MCC but Weston departed after three balls determined to compete in the duck race. Number three Sobek put on 29 with Wright for the second wicket, this being the highest partnership of the innings, the next being 25 for the fifth wicket between Clare and Blades. MCC were all out for 103 after 21 overs. Albert 1, caught, 1 stumping. MCC, 103 for 10 in 21 overs, lost to CCB, 182 for 7 in 30 overs, by 79 runs. The first round of the T20 cup and MCC eager to regain the cup we won in the first two years of the competition after losing heavily to Punjab CC in the first round last season. Pak Orient fielded only 10 players although they had a full team including a 12th man in their team list. Again it is not entered in the scorebook but since Pak Orient batted first I imagine they won the toss. Blades opened the bowling and removed Salman for a duck with his third ball but Pak Orient continued to score at six runs an over up to and including the 7th over when they lost their second wicket to Garner`s bowling. Thereafter MCC took wickets regularly thanks to some good, tight bowling all round and the run rate for the remaining 12 overs of the innings sank to around 3 per over, Pak Orient being all out for 81 in 19.1 overs. Weston and Sarma opened the batting an put on a rapid 43 before Weston went for 28 in the 5th over. Sarma went for 5 in the next over but Clare, Ferguson and Furlonger continued the rapid scoring and victory was never in doubt coming after 11.5 overs, so it is on to the semi-final at the Hirschanger against Serendib on 17th September. MCC, 84 for 3 in 11.5 overs, beat Pak Orient, 81 for 9 in 19.1 overs by 7 wickets. With one team, including the vice captain, away on tour in the greater London area and the captain checking up on the quality of huge quantities Bacardi and coke in the West Indies it was left to Blades to captain the side against the MICs at the Hirschanger. 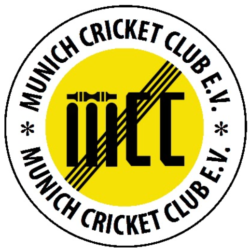 Getting a team together was not easy and only 10 players, including the first game for MCC for Manfred Veser, actually turned out. It isn`t recorded in the scorebook but since MCC batted first I imagine we won the toss. That was about the only thing we did right apart from some spirited defence by Sear and elder statesman Carr. MCC were bowled out for 85, 31 of them extras, in 32 overs. Some real progress was made in the 2011 duck race though. The MICs needed only 15 overs to knock off the runs, the best bowler being Wright with 2 for 13 off 4 overs. The bowling seems to have been quite tight with only 8 wides being bowled in the 15 overs, this being about half the normal rate this season. The one advantage of losing a game so quickly is it results in an early visit to the Chinese tower. After a quiet night acquiring some new club kit in Tottenham, the MCC made their way to Old Deer Park, home of Richmond cricket club, former stomping ground of Mr white line fever – Mark O’Meagher. The toss was negotiated by the captains with Richmond to bat first in a 40 over affair. After a gentle pre-match lolly warm-up, the MCC took the field raring to go. Scott and Fudge opened up for the MCC, and Scott had two early wickets: one in the pink for Turner and another one in the buckets for Clare at slip. Unfortunately, after 9.1 overs the heavens opened, with the game evenly poised at 37/2. There was a forced break of several hours, which was spent watching football and county cricket, and enjoying the teas. Samosas. Eventually the weather cleared, and a T20 was agreed upon, with Richmond to start their innings anew in the absence of Herrn Duckworth & Lewis. MOM opened up in the T20, and his former team-mate Harding-Smith dispatched him back over his head for 6 first ball. Needless to say MOM didn’t pitch any more up. Fudge, schnell aber wahnsinn, started at the other end with an 11 ball over and was promptly removed from the attack. It was quickly apparent that this was not a friendly against Tegernsee or Punjab, with Harding-Smith and first drop Roberts carting it everywhere, albeit helped by some generous MCC catching attempts. MOM had an early wicket caught behind, but Rabbani, van Dalsum and Turner’s mate mate Cameron Moore probably don’t want to see their bowling figures. Clare eventually bowled Roberts for 42 and picked up a second next over. Harding-Smith fell for 83 to Fudgy’s bowling in the last over, and Fudgy had a second next ball. Richmond finished 178/5 off their 20 overs. MCC went out with the intention to go down swinging. Rabbani, MOM, and Turner all hit a couple of lusty blows, but couldn’t carry on, and MCC sank to 75/5 after 11 overs. Lovell and Clare then put on 74 for the sixth wicket in 8.2 overs, attacking the spinners. Clare was bowled in the last over, and Harry fell in the same manner next ball. van Dalsum kept his head, and hit a single off the penultimate delivery to give Lovell, on 47, the strike for the last ball. The two MCC veterans somehow managed to scarper a 3 off the last ball to bring up a well deserved half century for Lovell. MCC ended on 153/7 – 26 short. Special thanks goes to Richmond for hosting us on a beautiful ground and making sure we did get a game despite the weather, and to MOM for lining up the fixture. Post-match involved a couple of quiet beers with both teams at the ground, followed by a chicken tikka masala or similar at the local curry house. The VC and Treasurer finished with a post-post-match/pre-flight night cap at Jim Belushi’s bar/hostel with the conversation coming to the conclusion that it had indeed been a quality tour. Tegernsee and MCC met for a 12-a-side 40 over friendly at the Hirschanger on 30 July, with MCC supplying 4 bodies to Tegernsee. Maxi won the toss, and elected to bat first on the new flicx under overcast skies. Blades had the new pill, and took the maiden wicket on the new flicx third ball – clean bowling the newly embossed MCC stumps. MCC members Albert and Miller then put on a solid partnership, keeping out both Blades and Ferguson, and scoring 13 and 24 respectively. VC Clare donned the (iron) gloves for the first 20 overs – 0 byes on his watch – with the skipper noting a possible future as a goalkeeper. Tegernsee squandered their solid start, with regular wickets falling in the middle overs. Dangermen Maxi and Yash were both dismissed cheaply – Wright bowling Maxi for 2, and Yash ran himself out for 3. Carr and Tazilder with 19 and 27* managed to recover things somewhat and set a Hirschanger-competitive 137. MCC used 11 bowlers, making a complete mess of the scorebook, with the wickets shared around. Jet took his first wicket for the club, having Robinson caught at slip. MCC were in a evident hurry to reach Goldsack’s leaving do before the Augustiner Keller ran out of beer, and quickly slipped to 65/7. Weston fell to a good catch in the deep, Sear was bowled by Yash, Aamruth was adjudged caught behind, Sarma was run out in a mid pitch mix up with Wright, Igor didn’t trouble the scorers, Clare could have walked for his LBW, and Brunskill got out just as the buffet arrived. Through all this Wrighty kept his head, and Ferguson came out and smacked 45 not out off just 40 balls. The eighth wicket partnership was an unbeaten 74, putting the rest of us to shame. A match anticipated with some excitement, MCC needing to win to retain any hopes of being league champions should Serendib come a cropper and Pak Orient needing to win to be league champions provided they beat Serendib. There had been some heavy rain in the night on Friday and probable showers were forecast for Saturday and, around 11am, the heavens opened with a violent hailstorn. However at the start there was some cloud and some sun, temperatures around 20°C and there was one rain interruption only, during Pak Orients innings. Despite using the correct coin, skipper Weston lost the toss and Pak Orient chose to bat, their innings being started at 12.40. At the agm two years ago there was a passionate discussion resulting in the club investing in some expensive bats to ensure our batters performed well. These were duly purchased and followed up with some new batting gloves, chest guards and thigh guards this year. The success of these measures are reflected in the stats and it was time to do something for the poor old bowlers. The committee recommended purchasing a new Flicx pitch because our bowlers are getting hammered with too many wides and no balls since umpires have started to call no-ball when a ball pitches off the matting, not, as was defined by Harit Khanna when he was umpiring coordinator, when the ball careers away after hitting the side of the matting. I think the reasoning behind the recommendation is to lay two mats alongside each other, thus doubling the width of the pitch and giving our bowlers a chance to bowl fewer than the 46 wides and 5 no-balls they bowled against Pak Orient. Extras, 52 of them, were far and away the highest score for Pak Orient, the second highest being 35 from Mateen. Had it not been for the extras all the MCC bowlers would have returned good figures but as it was, Wright was the pick or them with 3 for 24 in 4.4 overs. There was some very good fielding including a run-out of Anwar who can be dangerous and two superb catches by Van Dalsum. Pak Orient were all out for 180 after 39.4 overs. Up until the 10th over the scores were virtually identical but thereafter MCC lost wickets regularly and were 72 for 6 after 20 overs whereas Pak Orient had been 86 for 1 at the same stage. Wright and O`Meagher were the only batters to make any sort of score with 22 and 28 respectively and there was a rather enjoyable 10th wicket partnership of 21 from Blades and O`Meagher. The captain tried nine bowlers as he had in the other two league matches we lost but MCC were all out for 125 after 33.1 overs. On the positive side the duck race received a little boost with two ducks in the innings, one of them a newcomer to the race. So roll on the new Flicx pitch because the ball cannot be seen against the green background of our old Flicx, the umpires and visitors mock us for playing on such an unworthy specimen, we lose too much net practise time repairing it, the ball shoots and gives low bounce getting our batsmen out (not the opposition batsmen because we seem to have difficulty hitting the mat) and we bowl too many wides and no-balls on the old pitch. Once it is installed we will surely win every match. These were among the reasons given to me for justifying the purchase of the new Flicx and please excuse my vicious mickey taking as there has to be some fun in writing these damned match reports. Blades 3*, 4 overs, 0 mdns, 0 wkts, 16 runs. Heavy rain during the night and early morning promised a soggy pitch and an important toss to enable the winner to chose to bowl first. Both sides were clearly up for the game and were all fully present in their whites by 12.30. The captain duly lost the toss and, surprise, surprise, MCC were asked to bat. Although the weather was pleasant now, over 20°C and sunny intervals, the outfield was wet and batting second would be an advantage. Scoring was difficult for MCC openers, Weston and Wright and Wright fell in the eigth over with only 19 runs on the board to be replaced by Van Dalsum. He and Weston slowly accumulated runs with rare boundaries and, at the halfway stage of the innings, MCC were 68 for 1. The team talk had obviously been to be more aggressive after the break but with the score on 81, Weston went for 35 in the 23rd over to be replaced by Ferguson. He played his usual steady innings and remained 29 not out at the end after facing 46 deliveries and scoring only one boundary. Van Dalsum went for 33 in the 26th over with Sear and Goldsack following in the 27th and 30th overs respectively for only a few runs. When Clare came in he started in his usual swashbuckling manner and scored 20 off the first seven balls faced. He hit the penultimate ball of the match for what was at first signalled a boundary four. The batsmen returned to their respective ends and the umpire then revoked the boundary and called it a single run. The next ball was bowled without the batsmen changing ends and Clare was clean bowled. However the scorers pointed out to the umpires that since a single had been called Clare should not have been facing. This led to massive complaints from Serendib on the usual, familiar lines before, finally, play restarted with Ferguson facing the last ball which he diplomatically fended away. MCC had reached 197 for 5 in the 40 overs, a reasonable but not excessive score. Serendib opened with Milan Fernando and Dushanta and were welcomed in virtually every over with a ball begging to be hit out of the ground which Milan did invariably. He was out caught when he was on 20 but, unfortunately to front foot no-ball. He finally went in the eighteenth over having scored 86 from 58 balls including two fours and eleven sixes. At the halfway stage of the innings Serendib were 134 for 2. The only bowler to excert any real pressure was Wright who finished with 2 for 9 from eight overs, including three maidens and Serendib finished with 200 for 4 in 33.1 overs winning very comfortable.